Windy with periods of thunderstorms this afternoon. High 83F. Winds SSW at 25 to 35 mph. Chance of rain 100%. Winds could occasionally gust over 40 mph..
A few clouds. Low 63F. Winds W at 15 to 25 mph. Winds could occasionally gust over 40 mph. 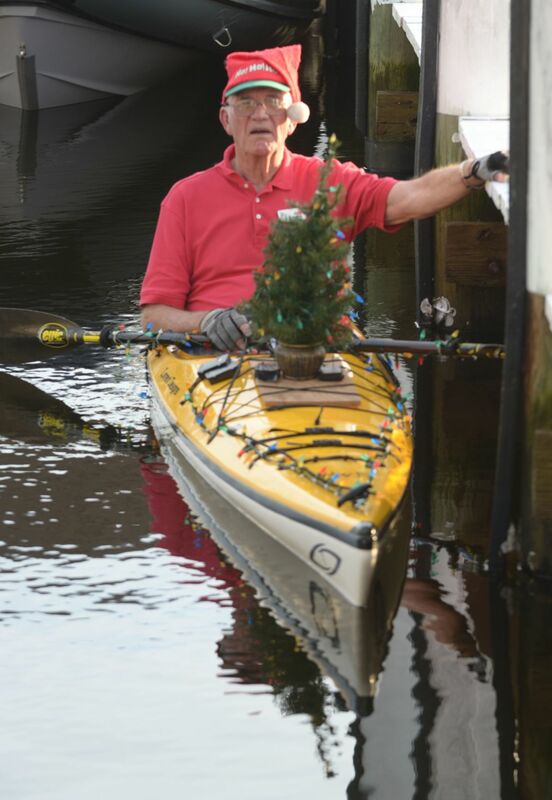 Jim McKenzie sits in his kayak all decorated in Christmas attire as he waits for others to put their kayaks into the water. Paul Benson gives a wave as he joins the group of kayakers. In the background, others are preparing to load some of the many kayaks into the water. Dave Zipoy treads water after he unexpectedly flipped in kayak. Fortunately the water was warm. Mike McDonald attempts to sort his “bees nest” of lights he will use on his kayak. Sharla and Dennis Cesari carry their kayak toward the water. Cathy Miller adjusts her Santa hat as she makes her way on the water. Kim Cramer is all decked out with ornaments as she waits to join the kayak parade. A mass of holiday kayakers hold up their paddles up prior to starting their canal light tour. A group of kayakers with holiday lights venture out for the evening paddle. Anne Peltier, left, and Cathy Miller paddle their kayaks for the evening tour. About 50 kayakers came out to celebrate the season with their decorated and lighted kayaks. After meeting at the Isles Yacht Club they made their way throughout the canals in true Christmas spirit. This annual event started about 17 years ago and draws a host of those loving to paddle.